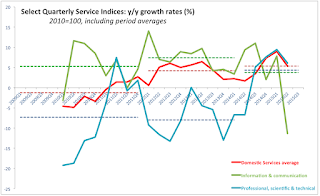 In previous post (link here) I covered Services PMI for Ireland for July. 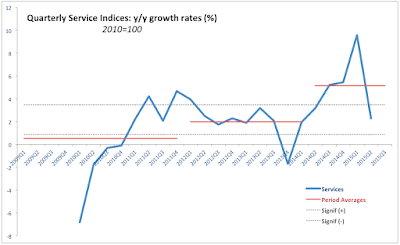 To remind you: we are witnessing a massive boom (according to the PMI data) in Services, with overall sector activity readings at 108 and 109 months highs in June-July. In addition, based on quarterly averages, Services in Ireland should have been expanding at a break-neck speed non-stop from 2Q 2014 through 2Q 2015, with 2Q 2015 marking small acceleration in an already formidable speed on 1Q 2015. Effectively, over the last 3 quarters, PMIs have been signalling very high rate of growth in activity, with rate of growth being relatively stable over time. Now, let's take a look at the latest quarterly data from CSO covering actual activity in the Services sector through June 2015. 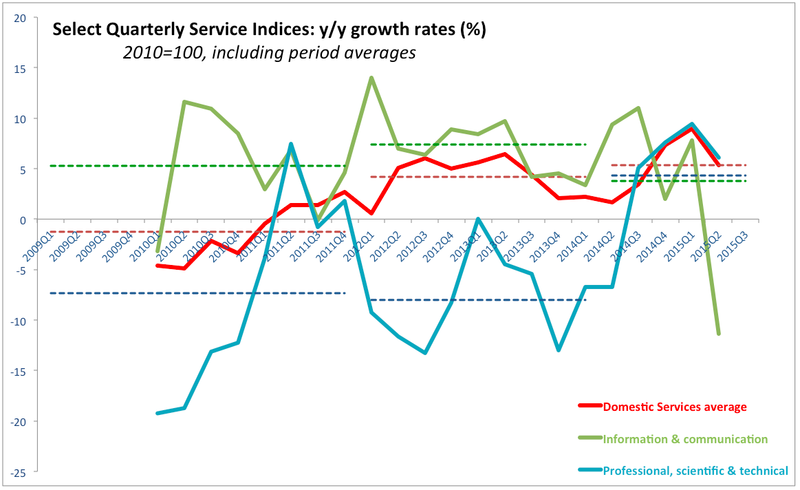 Overall Services Sector activity index for 2Q 2015 rose 2.3% y/y, which is markedly down on 9.6% y/y growth recorded in 1Q 2015 and marks the slowest speed of Services sector expansion since 1Q 2014. This simply does not correspond to the PMI data readings. In fact, growth has been quite volatile over the last 5 quarters, and again, not consistent with the PMI signals. As chart above indicates, Services sector growth fell sharply in 2Q 2015 falling below the period average (from 2Q 2014 on) and below the upper limit of statistical significance relative to the historical average rate. Contrary to the PMI signals, three out of six last quarters posted growth within historical averages and well below the period average when PMIs were hitting record highs. Domestic services sectors (Wholesale & Retail Trade, etc, Transportation & Storage, and Accommodation and Food, along with Administrative & Support services) posted an average rate of growth of 5.3% y/y in 2Q 2015, slower than both 4Q 2014 and 1Q 2015. Still, 2Q 2015 growth was the third fastest in 8 quarters. Over the last 6 months, domestic services managed to average expansion of 7.14% which is a major uptick on previous 6 months period when domestic services sub-sectors grew on average 5.40%. Information and Communication services index posted a decline of 11.4% y/y in 2Q 2015, the first drop in the series since 4Q 2011 and the sharpest drop in the series on record. The sector is so skewed by activities of MNCs that not much can be determined out of these figures. Still, this drop brought past 6 months growth down to -1.8% against previous 6 months' growth of 6.5%. In contrast to ICT sector, Professional, Scientific & Technical services sector posted a rise of 6.1% y/y in 2Q 2015, confirming yet again that there seems to be no serious correlation between activity in one side of our 'smart economy' and the other side of the same, despite endless droning on from our politicians and trade bodies about an alleged fabled link between the two sub-sectors through R&D and innovation. Despite all the issues highlighted above, the good news - as shown in the last chart - is that all three broadly-defined Services sectors have so-far been on a converging path prior to 2Q 2015 since roughly 1Q 2014 - as signalled by the compression of the period average lines. This, of course, reflects the belated return to growth in Professional, Scientific & Technical Services from 3Q 2014 on.